Location: Luckwell Road, Bedminster, Bristol, BS3 3HD. The classes are held in a private venue so please get in contact before coming for the first time. Classes are suitable for beginners, and cover warm up, forms, and combat applications. Cost: £7, £6 concessions. Move GB accepted. Private one-on-one classes offered, £15-25 per hour depending on your means. Many times available. For more info contact Jim on 07542065733, or through our facebook page. Hung Ga is a style of Kung Fu. 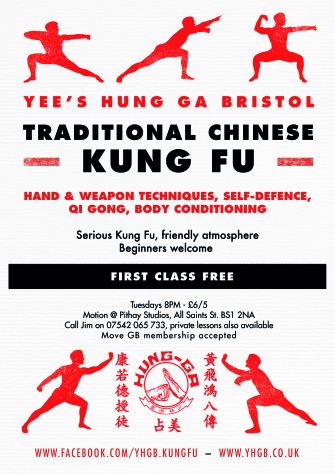 Kung Fu means skill gained through hard work, a concept which applies widely in life. The roots of our style go back to the Southern Shaolin Temple. Today we are an international association with head quarters in Guangdong, China, and branches in UK, mainland Europe, USA, and South America. For more information check out the Edinburgh Hung Ga page. Hung Ga is an effective and efficient fighting style, renowned for power. Power is generated through a strong foundation, using body mechanics to your advantage, and through combining the external and internal – using both muscles and breath together. Total body connection is the goal. As a student, you will 'forms' which are basically sequences of movements. A full list of the forms is given below. You will learn unarmed fighting techniques, including striking, kicking, locks, parries, evasion, and sweeps. Armed fighting techniques include long weapons (e.g. poles), short weapons (e.g. sword) and double weapons (e.g. double knives). You will practice partner drills and free sparring. Body conditioning will make your muscles, tendons and bones stronger. All the exercises are rooted in Qi Gong, which means that they will also be good for your health and boost your energy levels. The first form teaches the basic stances and techniques of Hung Ga. It develops foundation and the student learns where and how to place the feet in order to move between the stances correctly and with power. The focus of the second form is more martial. This form introduces the student to the theory of hard and soft power, represented in the form by the Tiger style’s explosive hard strikes and the Crane style’s soft whipping power. This form contains many famous sets, which can be trained independently as well, including the Ten Tiger Pattern, Five Element Fist, Drunken Style, and Ten Killing Hands. The first weapon in the system accustoms the student to using an object as an extension of the body. The form teaches grace and agility and many techniques that can be used when fighting opponents with long range weapons, such as a pole or spear. The double-ended or short pole form contains many techniques and movements from the other weapon forms. It teaches the student to coordinate both arms to generate more power than a single arm will (upper-body connection) and improves the power at the waist. The ability to coordinate the upper- and lower-body movements is improved with this form, though it becomes much more developed when training the long pole. The third hand form contains most of the style’s fighting techniques and applications. All five animals are represented. The Dragon trains the mind and spirit, emphasizes the twisting of the waist for power, and makes the practitioner changeable and unpredictable. The Snake style trains the Qi, teaches striking vital points on the body and is the fastest animal at short distances. The Tiger style trains the bones and tendons, and uses its body weight, alignment and extreme fierceness for power. The Leopard style trains the strength, and uses momentum and multiple strikes to disable the opponent. Finally, the Crane style trains the sinews, and teaches grace and balance, it uses patience to wait for the right moment to strike with speed and accuracy at sensitive areas. This set was famously used by Wong Fei Hung to defeat another master at a very young age. It lays the foundation of all the long-range weapons in the style. The student learns to generate great power through body connection, as movements of the upper body and lower body must be co-ordinated in order to wield the pole. This form teaches the student to separate the action of each arm, whilst still working together (like mother and son – hence the name). They are also known as “Butterfly Knives”. It teaches threading and quick steps as the knives are very short-range: the practitioner must close the distance with the opponent very fast. This form is the root of the Fifth Brother Eight Diagram Pole. The weapon is lighter and faster, however, and emphasizes piercing and slashing. Known as the ‘King of Weapons”, the spear form incorporates techniques used in military formations as well as single individual techniques. The famous “Gwan Dao” used by General Gwan, seen on many modern day altars. This long-handled heavy weapon concentrates on large strong movements while cutting and thrusting. Practising this form strengthens the entire body. The Tiger Fork is a long handled trident originally used to hunt tigers. Practitioners of this weapon become unusually strong and quick, as this weapon is heavy and difficult to manoeuvre. The final hand form trains the internal power and teaches the student to coordinate sound, breath, movement and internal energy. Both extremes of hard and soft are exercised in order to learn to combine them in different ways, the body learns to open and close, float and sink as well greatly improving on the connection between different parts of the body (such as upper- and lower-body). The Twelve Bridges philosophy is introduced and exercised. This form was created by our Grat Grandmaster Tang Fung. It utilizes close range conealed techniques, locks, and pressure point strikes to disable an armed or unarmed opponent. Not a hand form as such but a set of exercises that were brought into the style and developed further by Grandmaster Yee Chi Wai. This extremely powerful set is only taught to students that have been training for a minimum of five years, as the risk of injury is high. Through breath training and beating exercises, the whole body is conditioned, the internal system is strongly exercised and the tendons are stretched and extended.